If you’re looking for a filling meal for about $10, fast food restaurants isn’t the best choice. 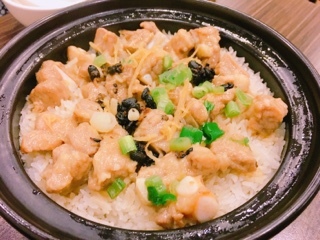 In the corner of a busy Chinese plaza sits Good Taste Casserole Rice. Here their combos are so large that sharing three amongst four people is perfect. Aside from the hefty pot of rice, each also arrives with soup and boiled vegetables. The soup is piping hot after being steamed in individual pots. 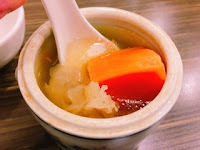 Inside the clear broth holds cubes of pork, papaya and white fungus. It’s unsalted so you’ll need a liberal sprinkling from the shaker at the table. 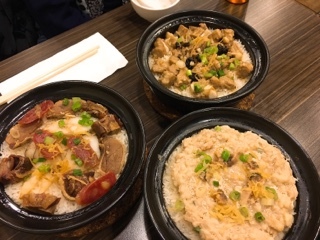 With dozens of casserole rice options to choose from, what to order depends not only on your preference but also the amount of crispy rice crust you prefer - in my opinion, the best part of the dish. Otherwise, you're really just eating baked rice with meat; why wait half an hour for that? 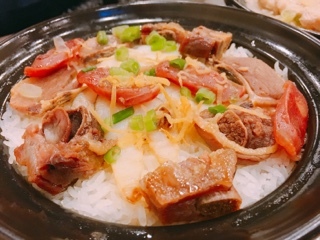 Although the preserved meats is normally not one of my favourite toppings, for casserole rice it's the best option as there’s less moisture resulting in a thick golden crispy crust. The assorted preserved meat ($10.99) contains lap cheung (sweet Chinese cured sausage), preserved duck, pork and fish so you get a bit of everything to sample. Good Taste doesn’t skimp on the ingredients with plenty of each. With the salted fish and minced pork ($8.99), there's still a layer of crust on the bottom, but the thickness diminishes and isn't quite as crispy. 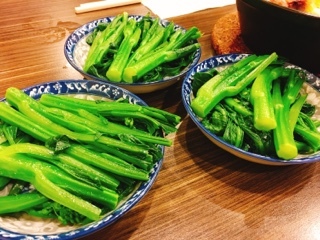 With a fair amount of salted fish chunks, the casserole let’s off a pungent aroma – heavenly if you enjoy the ingredient, like dried sweaty socks if you don’t. By the time you’re having a casserole rice topped with something like pork spareribs and black bean ($7.99) the crust becomes non-existent and tends to be hard and chewy. Of course, the spareribs is meatier and there’s a decent serving of it for the low price. 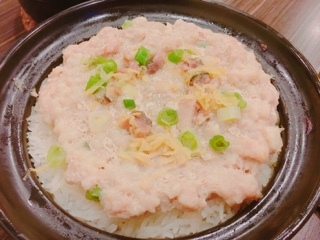 In the end, weather you enjoy a thick and crunchy crust or just a pot of soft moist rice, there’s an array to choose from at Good Taste Casserole Rice. Plus, the sheer amount of food you receive will be healthier and more filling than a burger combo any day.